Caltech physicist Kenneth Libbrecht is truly a renaissance researcher. He works on the LIGO project to detect gravitational waves from space, develops teaching equipment for classrooms, and photographs snow. 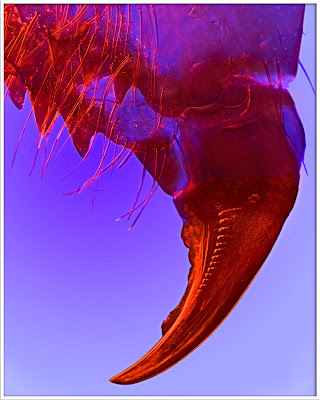 I'm sure he deserves awards for all the things he does, but it's the snow photos that won him the most recent Lennart Nilsson Award for scientific photography. 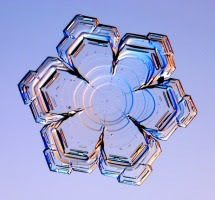 I could tell you a bit about his work, but he's already done such a great job with his website, Snow Crystals and his new book, The Secret Life of a Snowflake: An Up-Close Look at the Art and Science of Snowflakes, that I think you should just check them our for yourself. In particular, I highly recommend the many movies of artificial snowflakes growing in Libbrecht's lab, and my personal favorite portion of his website, the Guide to Frost. It's a little early yet to be thinking of snow falling from the sky here in Maryland, but Libbrecht's photos have given me an early chill. Some would look at a wet dog shaking off water and think only of running away to avoid the spray. For a group at the Georgia Institute of Technology, however, watching a dog do 'The Twist' reminded them of the motion of a washing machine during a spin cycle. They moved in closer for more. Andrew Dickerson and four teammates spent some time considering the fluid dynamics behind a wet, furry animal shaking itself dry. They garnered animal volunteers from Georgia Tech's research labs, the local zoo and from friends. The hairy and furry animals were appropriately doused and then filmed with high-speed cameras as they shed water from their coats. In order to represent mathematically what was going on in their videos, the team created a formula. Three variables were included: Surface tension, which the team decided was responsible for keeping the water droplets attached to the fur, centripetal force, which would be needed to release the droplets, and the animal's radius, a required variable when calculating centripetal force. They came up with the formula R^0.5, with R equal to the animal's radius. They then watched their videos to see if their math was correct. The team observed that larger animals shake more slowly when shedding water than smaller animals do. A grizzly bear shakes off water with a frequency of 4 Hz (or four back-and-forth shakes a second) while a mouse shakes at 27 Hz. When they plugged their numbers back in to their formula, however, they found that the correct approximation for what was going on was R^0.75. Dickerson, the team leader, hypothesized that this was because when measuring an animal's radius, they used the distance from the animals' center to its skin. Including the length of the fur, he thought, could be the difference. The Georgia Tech team will present their findings at the American Physical Society's 63rd Annual Meeting of the APS Division of Fluid Dynamics this November in Long Beach, Calif. There, over 2000 graduate students, postdoctoral researchers, university faculty and government and industry researchers will meet to share the latest and greatest in the field of fluid dynamics. Being able to shake itself dry is critical for a dog, Dickerson said. Otherwise, it would get hypothermia and die every time it got wet. Unfortunately, the formula created to represent this behavior doesn't have any useful applications yet, but there's always hoping on the innovation of tomorrow. In the meantime, check out the cute little mice and big fluffy dogs shaking themselves dry in the video up top. If it doesn't inspire you to create a new invention, at least it will make you smile. Bored at work? 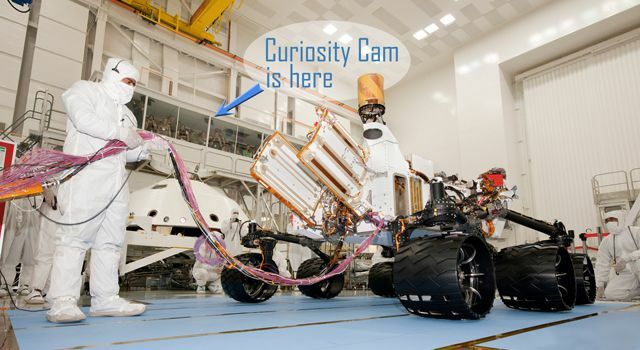 Watch real, live rocket scientists who, unlike you, are hard at work building the next Mars Rover - Curiosity! For more information about Curiosity and NASA's Mars Science Laboratory, visit Curiosity's web page. Pseudomonas aeruginosa is bad news. It's the Grendel of the bacteria world - an antibiotic-resistant opportunistic pathogen that creates particular trouble for cystic fibrosis patients. Luckily for us, Beowolf has just arrived ready to dismember his foe. 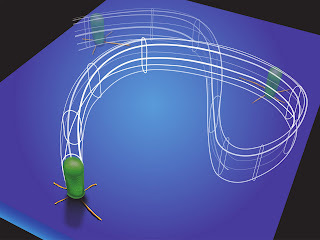 Photo: A schematic representation of a bacterium 'walking' on a surface. Courtesy of Dr. Gerard Wong, UCLA. It all started in an bioengineering lab where undergraduate students were studying videos of a bacterium called Pseudomonas aeruginosa (or P. aeruginosa for short). The students noticed something: Instead of sticking to crawling and tumbling like well-behaved bacteria, the bacteria stood up and started walking. "Once we found that, we studied it in much more detail," said Dr. Gerard Wong, professor of bioengineering at UCLA,who pulled in post-graduate students to help with the new study. 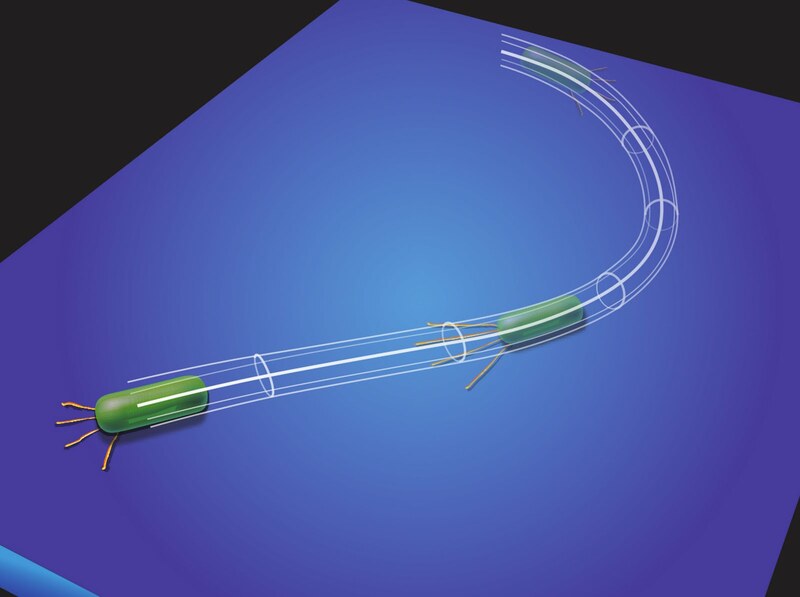 Photo: A schematic representation of a bacterium 'crawling' on a surface. Courtesy of Dr. Gerard Wong, UCLA. Bacteria exist in two states, Wong said. The first state is the free-swimming planktonic state in which bacteria run, crawl and tumble independently. The second state is the biofilm state in which bacteria organize together on a surface to form colonies. This colonization is the more menacing state for the medical field because bacteria that form biofilms are much more resistant to antibacterial drugs. P. aeruginosa is a 'model' biofilm-forming bacteria because of its extreme resistance to antibiotics. Though P. aeruginosa does not cause disease on its own, it is what is called an "opportunistic pathogen." It takes advantage of those with compromised immune systems, allowing for infections to develop that would otherwise be inhibited by a healthy immune system. Cystic fibrosis patients are especially predisposed to lung infections because of P. aeruginosa invasions. Were scientists to find a way to fight biofilm formation for this and other similar types of bacteria, it could mean cures for ample types of infections. Because of this new discovery, we may be closer than ever. The scientists have linked the walking behavior to biofilm formation. The bacteria's ability to walk, Wong said, is facilitated by special appendages called Type IV pili. What this means for us is that if the scientists can find a way to inhibit Type IV pili from developing - or chop the bacteria's legs off - they could inhibit the formation of biofilms as hosts for infections. Any bacteria with Type IV pili could be targeted, Wong said, and the UCLA-based Wong Research group intends to do more research on the strolling pathogens. "[This is] the tip of the iceburg," Dr. Wong said. After a bacterium divides into two daughter cells, one of the daughter cells stands up, walks away, and then detaches from the surface. 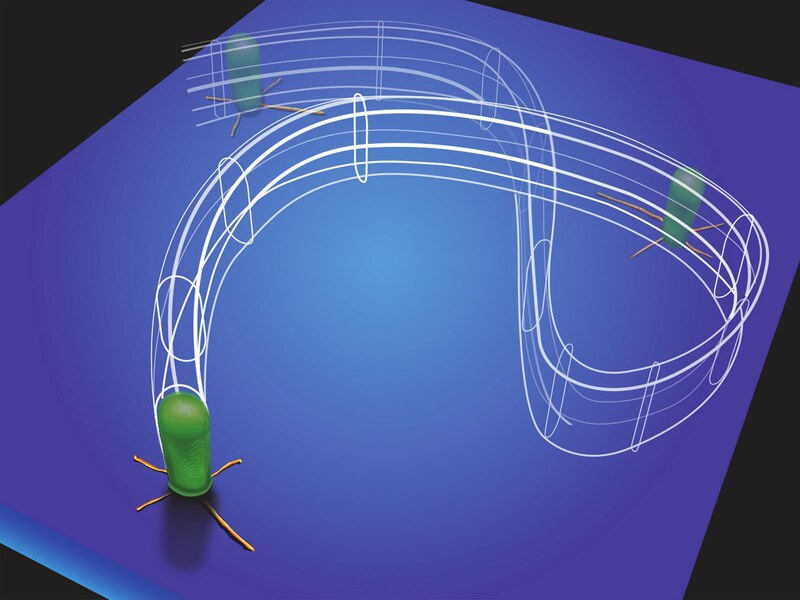 This new 'walking' mechanism, where the bacterium body is upright and perpendicular to the surface, is distinct from the commonly described 'crawling' movement, where a bacterium moves while lying down with its body axis parallel to the surface. After a bacterium divides, one of the daughter cells stands up before detaching from the surface. The other daughter cell remains behind. This difference in cell fates of two sister cells is observed in most division events. Read the original publication at the Wong Research group's website. Both Physics Buzz and Physics Central have been nominated for web awards from physics.org! Physics Buzz was one of five physics-related blogs nominated for a 'Best blog' award. The other contenders include Discover magazine's Bad Astronomy, Wired magazine's Dot Physics, Starts With A Bang, and Cosmic Variance - another Discover mag blog. Go to the physics.org website to vote for your favorite blog. While you're there, don't forget to vote in the 'best kids site' category, where Physics Central is also on the short list! In case you weren't one of the 500,000+ people there, here are some sights and sounds from this weekend's USA Science and Engineering Festival in Washington, D.C. Many queued up to have a picture taken with Bill Nye the Science Guy at The Planetary Society's LightSail booth. Nye, who is executive director of the Society, was also signing autographs. Did you ever want to see a tattoo being removed with lasers? Guests who waited in the long line at the LaserFest haunted house got to do just that, watching as Dr. Sean O'Malley, a LaserFest on the Road grant recipient, removed a tattoo from a pig's foot using a laser. Visitors also saw sound transferred across the room via lasers thanks to a SpectraSound laser sound transmission kit. Astronauts Ken Reightler (left), Pam Melroy and Brian Duffy signed autographs at Lockheed Martin's "Meet the Astronauts" booth. Ever wonder who is faster: Superman or the Flash? Dr. James Kakalios, of the University of Minnesota, had the answer. "The Flash, of course!" he said during his "Everything I Know About Science I Learned from Reading Comic Books" talk. Kakalios also explained what killed Gwen Stacy, Spider-Man's girlfriend, using physics formulas. Aspiring pilots took the controls of Lockheed Martin's F-35 Lightning II future fighter simulator. Visitors checked out Lockheed Martin's interactive "naNotube" to learn about the role of nanotechnology in everyday life. The LaserFest team paused at the end of the day on Saturday for a quick photo in front of the haunted house. Note: We've been experiencing problems with getting the video properly loaded to YouTube. If when you click 'play' you get a message that the video is not working, click on the thumbnail again to be redirected to the original video on YouTube. Thanks! President Obama announces he will appear on Mythbusters on Dec. 8. Top young scientists attend a science fair at the White House. And this weekend, hundreds of thousands of people are expected to descend upon the National Mall in the name of science. What's going on in Washington D.C. this week? October 10th marked the start of the inaugural USA Science and Engineering Festival hosted by Lockheed Martin. The free event is aimed at kindling young Americans' interest in science, technology, engineering and math. For the last two weeks, the festival has warmed up for the grand finale expo with events held in and around the Washington D.C. area. This weekend, the finale event will take place on the National Mall. Hundreds of exhibits will offer visitors the opportunity to fly a helicopter simulator, see how magnets help high-speed trains operate, learn how physics and engineering keep race car drivers safe during crashes and even meet astronauts and Nobel Laureats. The American Physical Society will also be there as part of the laser extravaganza at the LaserFest: Excite Your Imagination booth. Additionally, actors, scientists, musicians and comedians will perform and give talks on topics ranging from "Hip Hop, Video Games and Math" to "The Physics of Superheroes" to "X-ray Vision - Revealing Ancient Secrets With New Technology." On Saturday night, the telescope-manufacturing company Celestron, The Astronomy Outreach Foundation and Hofstra University are hosting a star gazing party where aspiring astronomers can spy on Jupiter and four of its moons and take a closer look our own moon. Caroline Moore, a 17-year-old astronomer who discovered a rare supernova at age 14, will also give a talk. Though the bulk of the activities take place in the nation's capitol, other satellite events are happening around the U.S. this weekend. The festival hopes to encourage interest in science by offering entertaining programs filled with scientific information that will appeal to a broad audience from the old to the young and the amateur to the expert. On Monday, President Obama hosted young scientists from across the U.S. at The White House Science Fair as part of the week dedicated to science. Mikayla Nelson, a freshman from Central Catholic High School in Billings, Mont., showed off a model-sized solar-powered car to the President. Nelson worked on a team to develop the car that won a first-place design award at the Department of Energy's Junior Solar Sprint. She built the body of the vehicle from scratch using lightweight carbon-fiber. Winners of the 2010 FIRST (For Inspiration and Recognition of Science and Technology) Robotics Championship also showed off their robot, "Miss Daisy," to the President. The team of high-school students had six weeks to build a robot from a kit of 100 parts before competing against 340 other teams in a soccer game-like challenge. To see highlights from The White House Science Fair, click on the video below. (If you watch closely, you'll spot Bill Nye the Science Guy sitting next to Adam Savage and Jamie Hyneman from Mythbusters). "I'm George, George McFly. I'm your density. I mean...your destiny." When the shy high school student George McFly confused the word 'density' for 'destiny' while trying to woo his future wife in "Back to the Future," he may have been on to something. Today marks the 213th anniversary of a day when density changed the destiny of the United States of America. 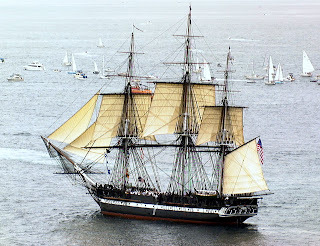 On Oct. 21, 1797, the USS Constitution - one of America's first naval vessels - slipped into the waters of Boston Harbor. 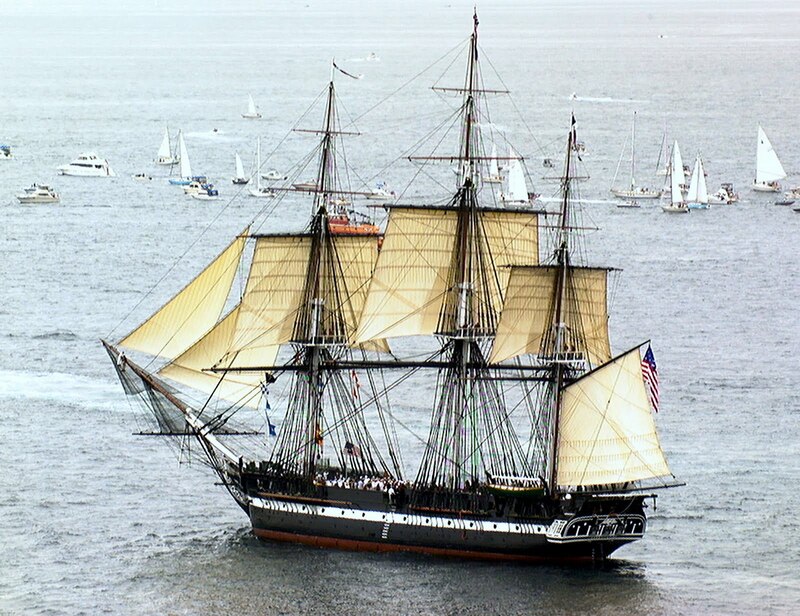 The 44-gun frigate nicknamed "Old Ironsides" was a ship unlike any other in the world at the time. Back in the days when ships were built of wood, the Constitution was built from a special mix of woods which were layered to strengthen the hull. Two of the most essential of the woods used in construction were southern live oak and white oak, both woods with very high densities. Southern live oak was a secret weapon of the U.S. Navy. The super-dense wood grows only in the southeastern U.S., making it exclusive to the founding fathers. By combining it with the highly-dense white oak, the ship's builders made the hull even more impenetrable from enemy fire. To understand why these dense woods were so important and gave the U.S. Navy such an advantage, we have to consider density for a moment. Imagine you are baking chocolate chip cookies and the recipe calls for one cup of packed brown sugar. First, you pour brown sugar into a measuring cup until it reaches the one cup mark. If you stick your finger in the sugar, it will sink in. Since the recipe calls for a cup of packed sugar, you force the sugar down and add more until you have a cup of closely packed sugar. Now if you stick your finger in the sugar, it will be much harder to penetrate the top layer. You've just done a density experiment! By forcing more sugar into the same volume - one cup - you've increased the density of the brown sugar. Density is defined as the mass of an object (brown sugar) divided by a certain volume (one cup) . As the mass increases for the same volume - as we pack more sugar into the same one cup - the density increases. And just as our denser packed brown sugar was harder to penetrate than the loose sugar, denser wood is harder for cannonballs to penetrate than less dense wood. This density came in to play when the U.S. entered the War of 1812 against Great Britain. On Aug. 19, 1812, the Constitution engaged in its most famous battle against the British ship Guerriere. The two warships met at sea and opened fire at close range. Thanks to the special dense wood of the Constitution's hull, the cannon fire from the Guerriere bounced off the Constitution, falling harmlessly into the sea. The sight of the cannon fire failing to penetrate the Constitution's hull reportedly incited one sailor to shout, "Huzzah! Her sides are made of iron!" giving the ship it's famous nickname. The Constitution then destroyed the Guerriere's masts, disabling the ship and winning the battle. Though this was a small battle at the start of the war, it was a propaganda victory for the young U.S.
Today, the Constitution, now the U.S. Navy's oldest commissioned vessel, is tasked as a floating museum. Visitors to Boston Harbor, where the Constitution is docked, can step on board to see for themselves the dense oak that changed the destiny of a young nation. As it turns out, relativity is a pretty tricky theory to try and wrap around your finger. Who would have guessed? 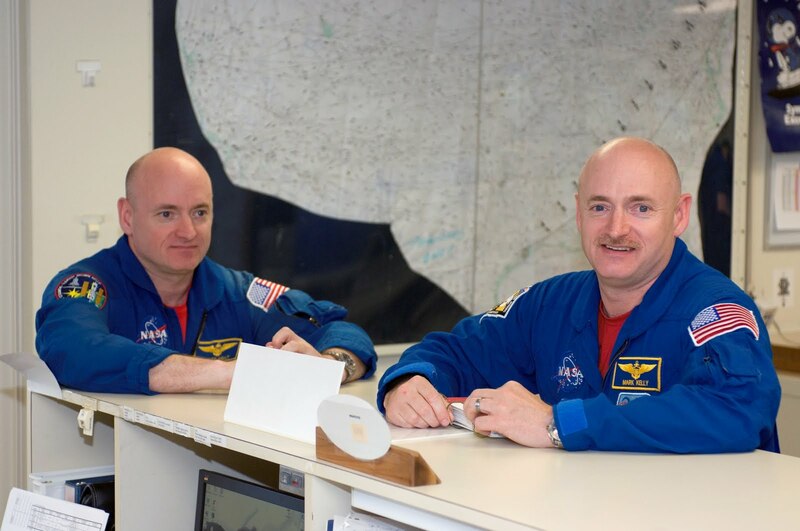 If you’ve been thinking about our astronaut twins from yesterday, then I imagine you’ve been doing a lot of head-scratching. Does general relativity cause Scott Kelly to age faster in space, or does special relativity and a slower-ticking clock take the cake? Buckle your seatbelt, because it’s time for the answer, and it’s a bumpy ride. Let’s imagine for a minute that we’re having a cup of coffee somewhere way out in the middle of space in a place so remote that there is next to no gravity. Looking back at a clock on Earth – using the telescope that just happens to be at the ready in this particular coffee shop – we would see time ticking by very slowly because Earth’s gravity was causing it to slow down. This is Einstein’s theory of general relativity. While we’re looking at Earth, we happen to see the International Space Station (ISS) float by. From our viewpoint, it looks like it’s crawling over the planet when really it's a few hundred miles above the Earth’s surface. The space station’s altitude varies occasionally, but on this day, it’s orbiting at an altitude of 264 miles (425 km) above the surface. In space terms that’s not far from the Earth’s surface, but it is far enough that the ISS isn’t feeling as much of a pull from gravity as people on the ground feel. Therefore, back at the coffee shop, we see time moving slightly faster on the space station than we do back on Earth. Now we know how time looks from very far away. But what about here on Earth? We’re concerned with how Scott Kelly, the astronaut on the ISS, will experience time compared to his twin brother on Earth. To do that, we have to consider both the general relativity, which wants to speed up the passage of time, and special relativity, which wants to slow down the passage of time thanks to the speed at which the ISS zips around the Earth. (Remember, special relativity kicks in more and more as an object’s speed increases.) The question becomes: Which type of relativity – general or special – has a stronger effect on the ISS? A lot of math is involved in finding the answer, but as it turns out, the ISS, with its orbital speed of just over 17,000 mph, is moving fast enough for special relativity to win! Scott is aging more slowly than his brother. 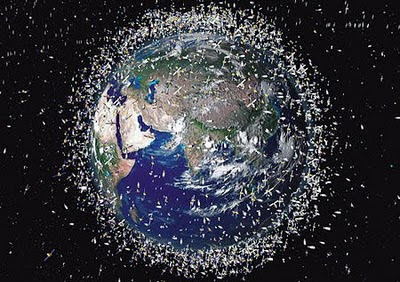 Were the ISS at a much higher altitude, where gravity’s pull is significantly less, and travelling a bit slower, like Global Positioning System (GPS) satellites do, then we would see the opposite. General relativity would win out and time would tick by a little faster than it does at home. Because astronauts stay relatively close to the Earth, however, they take advantage of a fortuitous mix of general and special relativity and age a little slower than their counterparts on Earth. How much less, then, will Scott have aged when compared to his twin brother Mark once Scott returns to Earth? Only a matter of milliseconds. For the younger of the twins, though, that might be just enough for bragging rights. Relativity enthusiasts will be excited to learn that in a few months, twin brothers will meet in space for the very first time! But who will age more, the brother spending six months in orbit, or the brother on the quick shuttle hop to the International Space Station? In March 2011, if all goes as planned, two twin brothers will meet in space for the first time ever. On Feb. 27, astronaut Mark Kelly (the one with the mustache) will launch aboard NASA’s space shuttle Endeavour to meet up with his twin brother Scott who's currently flying aboard the International Space Station (ISS). Scott made the trip up to the orbiting laboratory on a Russian Soyuz rocket launched on Oct. 7 and will be on board for the next sixth months. The event evokes Einstein's theoretical experiment called the "twin paradox," involving two twin siblings. In the experiment, one twin travels aboard a spaceship cruising near the speed of light to a star several light-years away, while the second twin stays on Earth. Years later, the star-voyaging twin returns to find his brother has aged many years while he is still rather young. But will we see similar behavior among the Kelly brothers come March? 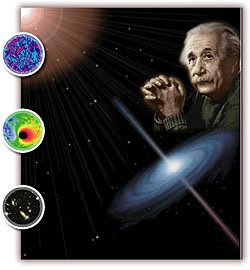 To answer the question we have to consider Einstein’s two theories of relativity: General relativity and special relativity. General relativity tells us that the greater the amount of gravity the slower the movement of time. Indeed, recent research has proven this to be true, showing that a man on a mountaintop ages faster than a man at sea level. So, one could argue that a man in low-earth orbit, about 200 miles above the Earth’s surface, would age faster than a man on the ground. However, special relativity tells us that time slows down for an object that is moving, giving us the twin paradox. Even though the ISS travels at a slow 17,000 mph – slow relative to the speed of light, or 671 million mph, where the theory of special relativity really kicks in – its speed is still be enough to cause the on-board clocks to tick a little slower than those back on Earth and the astronaut could therefore age more slowly. It seems that in considering Einstein’s twin paradox, we find our own low-earth orbit based paradox. Which theory of relativity will have a greater effect on the twin in space, gravity-based general relativity or motion-based special relativity? Will Scott in the ISS age faster or slower than his Earth-bound twin brother Mark? Tune in tomorrow for more! With the autumn season comes change: Trees' leaves change colors, young students greet new teachers, and hats, gloves and scarves replace swimsuits, shorts and sunscreen. In the spirit of that change, allow me to introduce myself as the latest APS science writing intern! I'm a recent graduate of Northeastern University, where I earned a master's in journalism. Before that, I worked for two years at a meteorology software company in northern Massachusetts, though I'm actually a native Texan. I chose the alter ego "Echo Romeo" as a nod to my undergraduate alma mater, Embry-Riddle Aeronautical University, in Daytona Beach, Fla., where I got a degree in meteorology and spent some time flying. At Riddle, each airplane's tail number ended in "ER" for "Embry-Riddle." In the phonetic alphabet, as the letters would be said to air traffic controllers, "ER" is "Echo Romeo." So, it's actually really geeky and has nothing to do with Shakespearean romance. 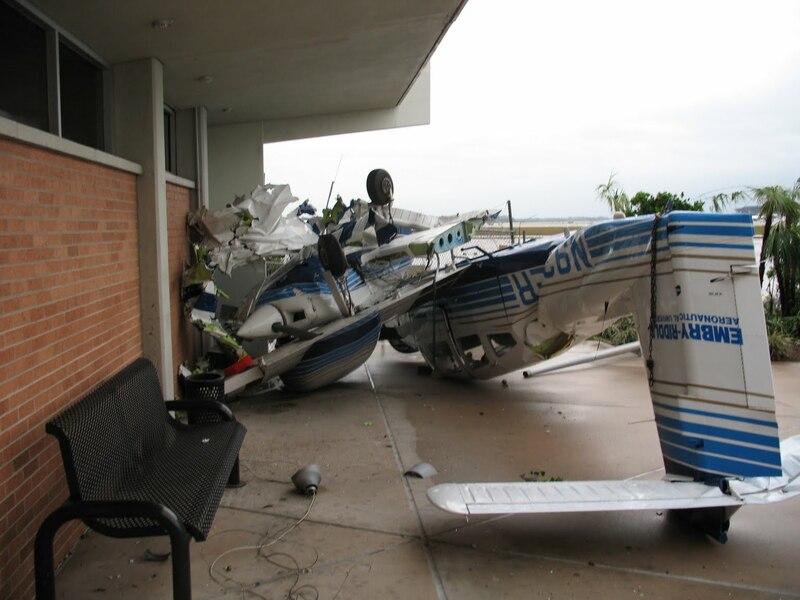 Though it was a sad event that ultimately resulted in $50 million worth of damage to the school, for a meteorology student, it was downright fascinating. Science in action! I remember my professors piecing together the evidence on campus as they debated whether the destruction was indeed caused by a tornado or instead by a microburst. Although I'm not a physicist, I did study physics as a part of my meteorology degree and have a deep appreciation for those who can make math and physics digestible for any audience. Here, I'll try to do the same for you. Happy reading! One of my favorite poems, which my grandmother used to tell me, was A.A. Milne's The Four Friends. Partly I was tickled that I and the snail in the poem shared the same name, but more than that, I loved the odd grouping of a massive elephant, powerful lion, bumbling goat and tiny James the snail. For the snail, a journey to the end of his brick was clearly an awesome odyssey, requiring a compass to keep him on course. What an amazing accomplishment for that little fellow. Now former astronaut Buzz Aldrin, among others, is doing his best to encourage all of us to travel to the end of our brick, by which I mean take a trip into low Earth orbit. The first few travelers aboard Virgin Galactic's spacecraft will only make suborbital trips about 100 kilometers high, but some day soon they hope to offer tourists extended stays a couple hundred kilometers up. Sounds like a lot of fun, if you don't mind a bit of radiation exposure. Of course, anyone who tans on the beach has made an informed choice to accept the risk of radiation (in the form of ultra violet light) for beauty and relaxation. So I imagine plenty of people would take on similar risk to head to orbit, although there's no tan from space travel to impress your friends with. The thing that amuses me about the venture is the insistence of Aldrin and other space tourism proponents on using grand terms like Star Traveler rather than space tourists. They will, after all, barely step off of the planet. Low orbit travelers will circle the planet at a distance equivalent to about one percent of the Earth's diameter. It might give them a cloudless view of the stars, but it hardly qualifies them as traveling among the stars. Maybe this is just the beginning, you might argue. Low Earth orbit today, and to the stars tomorrow! Unfortunately, you're not going to squeeze that trip into a summer vacation. The nearest star is 4 light years away, which means that if you could travel at the speed of light (which we can't), it would take you four years to get there. And then there wouldn't be much to see other than a star. You might as well look at it through a telescope. The nearest known habitable planet/star system, Gliese 581g, is about 20 light years away. You might make there in your lifetime, but by the time you get back you will have spent most of your life in transit. So, are we likely to become Star Travelers any time soon? And will Virgin Galactic ever offer travel beyond our moon? Probably not. But I'll still be thrilled to take a ride a few hundred kilometers into the sky. At least it's a little way past the end of my brick. Looking for extra dimensions by measuring gravity at the microscopic level. Scientists know how gravity works at big distances -- the inter-planetary or inter-stellar range -- but does it work the same way at the inter-atomic range? A variety of tabletop experiments are trying to explore this issue. Already some theorists say that a departure from conventional gravity behavior could hint at the existence of extra dimensions. Isaac Newton’s theory of gravity is one of the great stories of science. It correctly showed that the moon’s motion around the Earth, Earth’s orbit around the sun, and the fact that we all remain safely fixed to the Earth’s surface were all manifestations of a single force: universal gravity. One of the critical parts of Newton’s theory is an equation stipulating that the force of gravity between two objects gets rapidly weaker as the distance between them increases. Called the inverse-square law, it has been tested over the years both by observing the actual movements of the planets and stars and by experiments conducted in labs that examined gravity at the level of a few feet. A new detection apparatus proposed by the National Institute of Standards and Technology in Boulder, Colo., hopes to explore gravity at the 100-1,000 nanometer level -- larger than atoms but many thousands of times smaller than any previous experiment has achieved. They hope to measure gravity over the shortest range yet. Their apparatus consists of a tiny glass bead suspended in vacuum by laser beams. 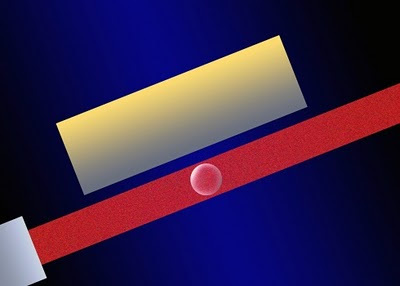 A gold rod is swept past the bead, disturbing its place in the laser beams. The bead then oscillates back and forth, and this pendulum-like motion provides a way to precisely measure the force of gravity between the rod and the bead. One of the difficulties of measuring gravity is that it is so weak. Of course gravity is strong enough to keep the Earth going around the sun, but that’s only because the sun and the Earth are so big. Compared to the other physical forces, such as the electromagnetic force holding atoms together or the strong nuclear force holding nuclei together, gravity is incredibly weak. Lab tests of gravity have to shield against interfering effects from the kind of stray electric fields that can fill an ordinary lab. Electric fields, in the form of radio waves, bloom from just about any powered device in our vicinity, as well as surrounding microwave towers and radio antennas. One of the NIST researchers, Andrew Geraci, said that the micro-spheres he plans to use will be carefully prepared to have no net electrical charge, which helps to guard against electric interference. Using light to suspend the spheres eliminates friction, further insulating them from their environment and making gravity measurements more precise. "The apparatus is an excellent sensor of small forces," said Geraci. "It could be significantly -- 100,000 times -- more sensitive than previous short-range gravity experiments at the micron-- (one millionth of a meter -- scale, possibly yielding exciting new discoveries." One of the discoveries he has in mind is determining whether gravity falls off with distance even faster than Newton specified. Some theorists believe that one reason gravity is so weak is that it bleeds off into extra spatial dimensions that are difficult to measure with scientific detectors, much less with our own human senses. Thus a study of gravity with a tabletop experiment could help to find such hypothetical extra dimensions. It might also help scientists discover forces never thought of before by theorists. In this way, tabletop experiments can be complementary to the kinds of gigantic experiments performed at particle accelerators, where evidence for extra dimensions and new forces is teased out of the debris left over from the fiery collisions of particles traveling near the speed of light. 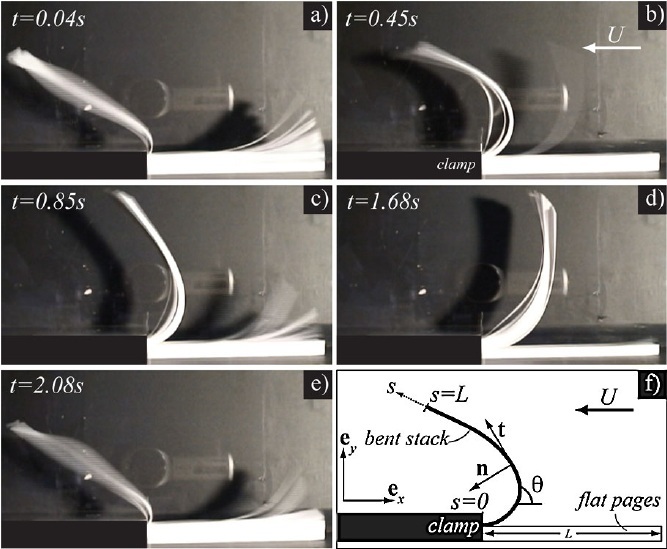 Previous tabletop experiments have explored close-in gravity by watching how a carefully suspended weight undergoes a torsion-like swivel in the presence of other nearby weights. Eric Adelberger, a physicist at the University of Washington in Seattle, has worked on that kind of gravity measurement. He suggests that the NIST researchers have an interesting and novel approach for studying short distance forces, one worth pursuing. "However, being able to measure small forces does not, in itself, allow one to study gravity at short distances," Adelberger said. The real problem, Adelberger believes, is getting rid of the systematic influences -- the things, like those stray electric or magnetic fields in the lab, that might confuse a measurement -- which grow rapidly more important as the sizes of the interacting bodies get smaller. This might not be easy to do. For this reason the sensitivity needed for studying gravity over such short distances, even with the NIST design, might be hard to achieve, Adelberger argued. Physicists are searching for the fingerprints of cosmic strings. Physicists are hot on the trail of one of strangest theorized structures in the universe. A team of researchers have announced what they think are the first indirect observations of ancient cosmic strings, bizarre objects thought to have contributed to the arrangement of objects throughout the universe. First predicted back in the 1970s, cosmic strings are thought to be enormous fault lines that once existed in space. Not to be confused with the subatomic strings of string theory, cosmic strings are widely believed by astrophysicists to have formed billions of years ago, just moments after the Big Bang when the universe was still a soupy mass of extremely hot matter. As the universe cooled, defects formed between different regions of space that cooled in different ways, much like cracks forming in the ice on a frozen pond. These defects in space were the cosmic strings. Although researchers have not yet directly observed the strings themselves, the team believes they found evidence of them hidden in ancient quasars, enormous black holes that shoot out mighty jets of light and radiation, found at the heart of many galaxies. The presumed cosmic strings were incredibly narrow, thinner than the diameter of a proton, but so dense that a string less than a mile in length would weigh more than the Earth. As the universe expanded, so too did these strings until they either stretched across the known universe, or into enormous rings thousands of times larger than our galaxy. 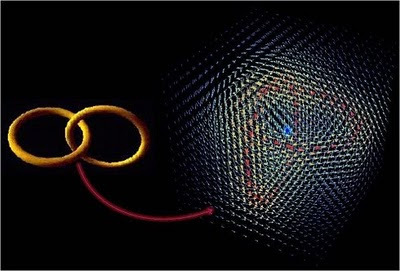 "Their magnetic field sort of hitches a ride with the expansion of the universe," said Robert Poltis from the University at Buffalo in N.Y. and lead author of the paper reporting the findings. Poltis' team analyzed the observational data of 355 quasars that reside in the far off corners of the universe. With careful scrutiny of the light emitted by these quasars, it is possible to determine the direction their jets are facing in space. The team found that 183 of them lined up to form two enormous rings that stretch across the sky in a pattern unlikely to have formed by chance. The team members think that the magnetic fields of the two cosmic strings affected the direction the quasars are pointing. 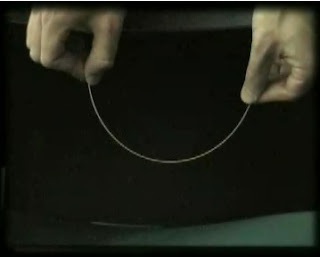 The strings themselves should have long since dissipated by emitting gravitational radiation as they vibrated; however the original effect on the alignment of the quasars would have remained. "The string itself is gone, but you get the magnetic field imprinted in the early universe," Poltis said. To check their hypothesis, they modeled the theorized effects of the strings on the formation of quasars, and found their predictions closely matched their observations. Poltis added also that they still need to conduct more follow-up observations and analysis before they can be completely sure they have found evidence of the strings. The detection of a cosmic string would be an important cosmological discovery because of their theorized importance to the formation of galaxies in the early universe. However, other researchers are cautious about the results. Jon Urrestilla of the University of the Basque Country in Biscay, Spain, doesn't want to jump to conclusions too quickly. He said that Poltis' research is exciting because his team is making testable predictions. "It is still early to say that this work has discovered evidence for cosmic strings. It is promising, the science is sound, but one should be careful. There are assumptions made that need be checked," Urrestilla said, "But it is yet another piece to the puzzle, and the more predictions we can make from the same basic science into presumably independent effects, the closer we will be to detecting whether strings really were there." Tanmay Vachaspati from Arizona State University in Tempe, a leading expert on cosmic strings, said he thought that the observation of lined-up quasars was puzzling, but he was skeptical it was caused by cosmic strings. He said that had the strings formed nanoseconds after the big bang, they probably would have decayed so quickly that their magnetic effect wouldn't last until today. "I don't see them staying around until today to provide observational signals," Vachaspati said. Their paper was published in Physical Review Letters on October 11. With the release of Hot Tub Time Machine, we have entered a new era of science fiction. But unless you were paying close attention, you may have missed the paradigm shift. In past decades, movies about time travel seemed to focus primarily on the butterfly effect (how a small change in the past can make a huge difference in the present) and paradoxical questions (What if you traveled back in time and prevented your own birth?). Those sorts of premises are the basis for movies like The Butterfly Effect (surprise surprise), Back to the Future (I, II, and III), The Terminator series, Bill and Ted's Excellent Adventure, and on and on. It wasn't always that way. In fact, I would call the sort of time travel those movies depict as the second coming of time travel fiction. It's a very empowering take on things, which is just what you might expect from the me generation of the time, because it emphasizes how important even the least significant being or event can be in the long run. In older interpretations of time travel, people and their actions are essentially meaningless in the grand scheme of things. The classic book (and later movie) The Time Machine by H. G. Wells, for example, follows a brilliant scientist's adventures as he travels across hundreds of centuries. At the end of the book, after battling the evil Morlocks and falling in love with a beautiful and fragile Eloi, he ends up right back where he started, just in time for dinner. He fails to convince his dinner guests that he went anywhere (anywhen?) at all, primarily because he might as well never have left, for all the difference it made. In Wells' interpretation, it's as if past, present and future are somehow permanently set, inscribed on the four dimensional universe like a panorama chiseled on the Great Wall of China; we can only see a little at any moment, but no matter how far forward or back we move, we can't change the pictures. You may not have realized it, if you happened to see Hot Tub Time Machine, but we have now moved on to yet another interpretation of time travel: the multiverse. Considering the fact that Hot Tub's Adam (John Cusack), Lou (Rob Corddry) and Nick (Craig Robinson) were weened on movies like Back to the Future, it's not surprising that they believe the old school time travel rules they remember from their youth. That's why they struggle to do exactly the same things they did on their epic ski trip in the 1980's, for fear that even the slightest change in the past will jeopardize the present existence of Adam's nephew Jacob (Clark Duke). In the end (I'll try to be vague enough not to spoil it for anyone) they return to a radically different present than the one they left. However, it's not because of the butterfly effect or the grandfather paradox. The shift in premise is a bit subtle, but there are no time travel paradoxes in Hot Tub because their actions in the past don't actually change the present, instead the movie just follows the group along a path to a different, but equally valid, present. Imagine the multiverse to be like a tree with many branches. Going back down the tree to murder your grandfather creates a new branch that leads to a time where your father and you don't exist. The branch you came from (where your grandfather did not die) is still there, as are many branches where different versions of you exist, and many where you don't exist at all. The slightly different approach to time travel in Hot Tub leads to all sorts of mayhem and humor similar to, but not exactly like, the sort of stuff we've seen in the movies for ages. Nevertheless, I highly recommend Hot Tub, both because I love the sort of comedy that Cusack, Corddry and Robinson bring to their roles and because the film marks a major shift in science fiction. Mark my words, one day Hot Tub Time Machine will be required watching in film history classes everywhere, at least in this branch of the multiverse. 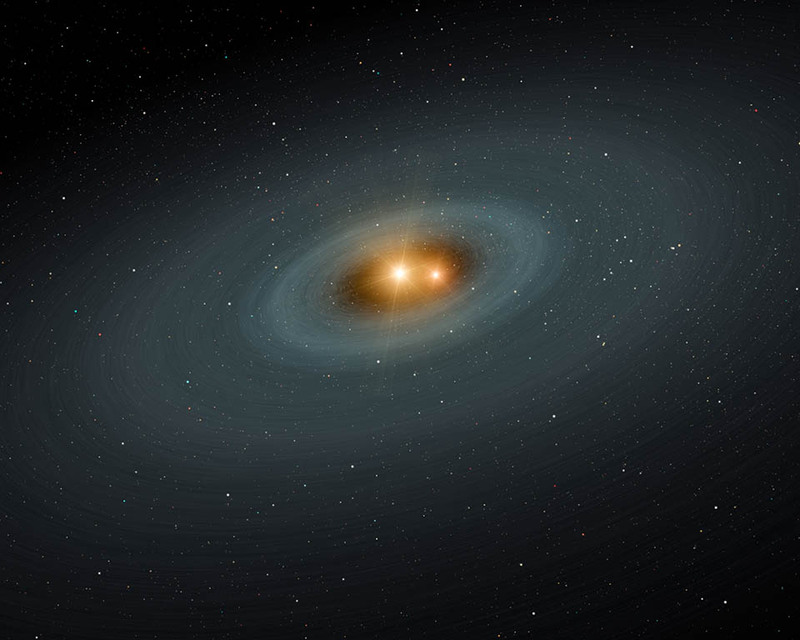 Today, PhysicsBuzz continues its conversation with Marc Kuchner from NASA Goddard, who was part of the research team that recently announced they discovered a dust cloud orbiting a class of binary stars. The team thinks it's likely the dust came from planetoids smashing into each other. Marc tells us more about the science used to find the dust, and why they think it's probably the leftover ashes of an obliterated solar system. The odds are nearly certain that a baby born via in vitro fertilization will win a Nobel Prize before the turn of the century. Robert G. Edwards, the "father of the test tube baby," won the Nobel Prize in Physiology or Medicine yesterday for developing in vitro fertilization, a process involving the fertilization of human eggs outside a woman’s body. This technology was first used successfully in 1978, and since then an estimated four million babies have been born in this way. With such a large number of children, one can ask what are the odds that one or more of Edwards' test-tube progeny will eventually go on to win Nobel Prizes of their own some day? As it turns out, the answer is remarkably high. The probability that at least one Nobel prize winner in the next 50 years will have been born using assisted reproductive techniques is at least 80 percent. And it is almost a certainty that such a baby will win a Nobel Prize before the turn of the century. Only slightly more than 1 percent of live births in the U.S. result from assisted reproductive technology (ART), which includes not just the in-vitro fertilization but also the use of medicines and other procedures. So how can the 80 percent figure arise? The calculation goes like this: There are six Nobel Prizes awarded each year, and they are often split among multiple recipients. For simplicity, we make the following assumptions: on average about eight people will win Nobel prizes every year in the relatively near future when the test tube babies are old enough to begin winning the award; that the rate of slightly more than 1 percent of live births resulting from assisted reproductive technology will hold steady in the United States and in other developed nations, where most Nobel Prize winners come from. Following these assumptions, we can estimate that 1 percent of the “Nobel-likely” population will have been conceived through ART, and 99 percent will have been conceived naturally. The oldest test tube baby is only 32 years old today, and most Nobel Prize winners are over 60. So it will be many years before someone born via ART would be likely to win. Before then, the probability that a test tube baby will win in a given year probably ranges from 0 percent for 2011 to less than 0.1 percent in 2025 -- not too great in any given year, especially now. 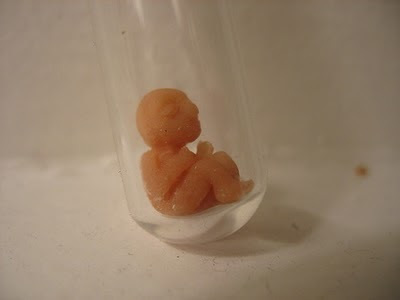 Around the year 2050 the proportion of test tube babies among 60 year olds will be about one percent. The probability, then, that all 8 winners were “natural conception” babies is 0.99 multiplied by itself eight times. This works out to be 92.3 percent. This means that in 2050 there is a 7.7 percent chance that at least one of the winners was conceived using ART. But considering the cumulative effect of the probabilities each year over the better part of the next century tells another story. The only way for no test tube babies to win a Nobel Prize between 2011 and 2060 is for all the winners to result from natural conception. That probability, which is the calculated by subtracting from 1 the product of the probabilities of all naturally conceived winners each year from 2011 through 2060), is only around 16 percent. Thus, the probability that at least one test tube baby wins the Nobel Prize over the next 50 years is about 84 percent. So, it is very likely that one of Dr. Edwards’ test-tube babies will receive the Nobel Prize by 2060. By 2065, the probability is 90 percent. It reaches 95 percent in 2073 and 99 percent in 2091. Given that, it seems almost certain that a test tube baby will win a Nobel Prize this century. Actually, the real odds may be even higher, since it is likely that babies born using ART will be born to more affluent and better-educated parents. It follows that the education levels of these children will likely be higher than that of the general population. Since most Nobel Prize winners have graduate degrees, these “test tube babies” already have a slight advantage in their pursuit of the prize. So, these estimates are probably a bit low. Lightning strikes twice for Ig Nobel Award Laureate Andre Geim! Along with his colleague and former grad student Konstantin Novoselov, Andre Geim has won the Nobel Prize for pioneering work the two performed on the arduous path towards an invisible hammock for cats (not a hammock for invisible cats, that would be crazy). Bear in mind, we're not there yet. 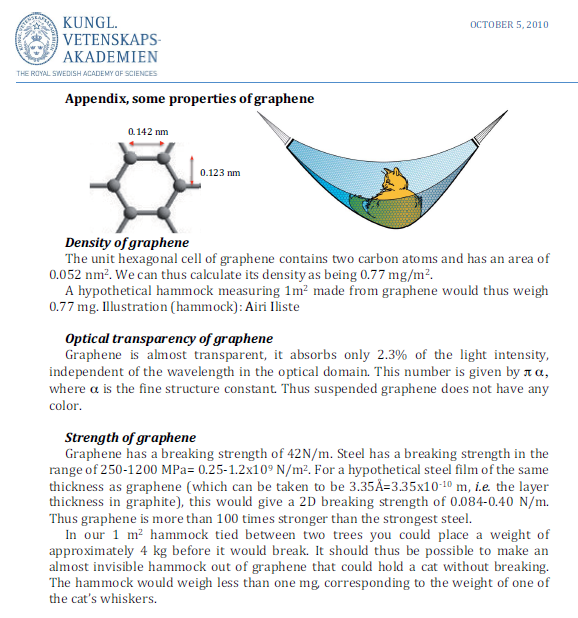 All Geim and Novoselov have done so far is find graphene, which in theory could be the ideal material for an invisible cat hammock, according to the Scientific Background provided by the Nobel Academy (I'm serious, see page 7). Of course, cat hammocks are pretty high level applications, which I suppose is why the Academy chose to include them in the advanced scientific background for the prize rather than the more basic information for the general public. I'm sure Geim is pleased with the Nobel Academy's nod, but I will always think of him as the first person (along with Sir Michael Berry) to magnetically levitate a frog. What concerns me is that the Nobel Prize may expose Geim to claims that his levitating frog experiments were fraudulent. Now I don't believe this for a moment, but surely if you can make an invisible cat hammock, an invisible frog hammock would be child's play. I'm certain his frogs were being held aloft by magnetic fields, as Geim and Berry claim, but I have to admit when I see videos like this one . . .
. . . 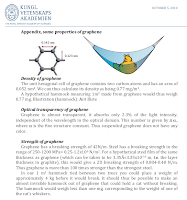 I completely understand why you might think that it's a trick played by someone swinging a frog around in an invisible hammock made of graphene. Listen folks, let's be reasonable. Geim and Novoselov didn't find graphene until 2004, but Geim started levitating frogs in 1997. He couldn't possibly be holding his frogs with invisible frog hammocks . . . unless he suspected that levitating frogs trumps finding really thin sheets of graphite. In which case, it would only be logical to keep their graphene discovery a secret long enough that no one would make the connection to the amazing floating frogs. Of course, that would be ridiculous. It's not like he'd made an invisible cat hammock or anything - those are still still several months away, at least.